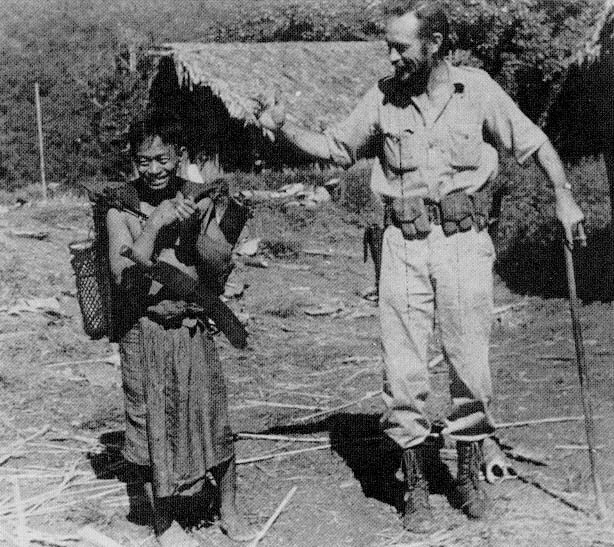 A Kachin villager wearing a sword-dao, photographed with Lt. Vincent Curl of OSS Detachment 101 during World War II. Compare what appears to be the non-open side of his scabbard with its low mid-rib and rattan binding with the picture of the scabbard of example 1 above (which is inverted relative to the position in which it would have been worn). Photograph from CMH Pub 70-42 U.S. Army Special Operations in World War II, courtesy of the U.S. Army Center of Military History.